Back when Hasbro was still doing three-figure sets for their comic packs, it was a really good value: for 10 bucks you could pick up characters you missed the first time around, new versions of old favorites, or even some all-new characters! Can't beat that. Plus, hey, free comicbook! It's a bit less impressive now that they're just two-packs, but a lot of the three-packs are still worth hunting down. It is believed that Scrap-Iron is a product designer for the armament company owned by Destro. Scrap-Iron carries out initial field-testing on all new armor-piercing munitions and sub-munitions. His area of specialization is remote-launched, laser-guided, rocket-propelled piezo-electric fused anti-tank weapons. These weapons are categorized beyond the "smart" stage and are known by the nomenclature "brilliant." He is methodical and precise, plotting out moves, countermoves, and counter-countermoves to anticipate all possible scenarios for a given situation. He frequently irritates others with his demands for perfection, but he is tolerated because everyone knows that he always gets the ultimate job done: to completely disable any and all approaching enemy vehicles. Scrap-Iron's colors are brighter than the original 1984 version, but it still suits him. His body is cobbled together from many different sources: his legs are from the original Cobra Trooper and his arms come from the GI Joe tank driver Thunder. The hips, chest and head are all vintage Scrap-Iron, and since they're the most distinctive parts of his "look," that's a good thing. He's got that crazy molded-on helmet, the padded, buckled vest, with a pocket and two grenades on the front, and the odd lining around his upper legs. Sadly, while he has more weapons than he can carry, Scrap-Iron doesn't include his big trademark rocket launcher. He does have a bazooka-lookin' thing, but it's one of the goofy sci-fi things from the early '90s. And while the pistol and machine gun are nice, simple affairs, they just lack the kind of huge destructive power Scrap-Iron demands. Bring back the free-standing launcher that made the guy famous! A secret cabal of Cobra scientists combed the dusty vaults, tombs, and sarcophagi of long-dead despots, scraping together enough DNA to achieve a warped plan: a supreme leader dedicated to evil. They succeeded beyond their wildest dreams. Serpentor is a military genius, ruthless tyrant, fearless warrior, financial sorcerer, and political demigod. 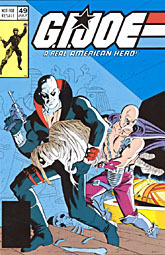 His plans are subtle, vicious, and intricate, making him a formidable enemy of GI Joe. Even Cobra Commander has to watch his back in case his genetic brainchild tries to wrest control from him. The conquests of the distant past still echo in his mind, urging him to achieve the glory his DNA still remembers... and he'll stop at nothing to again grasp the world in his hands. 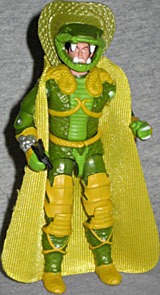 At a glance, this Serpentor looks like a duplicate of the 1986 version. The, when you stop and think about it, you realize what's been changed: the colors are reversed! He used to wear a suit of golden scales, with green armor and snake detailing above it. Now he wears a green suit with gold armor. It's a small change, but it works nicely. If you have both of them, stand them together and make it look like a photo negative. Another welcome change, one that isn't immediately apparent in the packaging, is that Serpentor's helmet can be removed, a first for the character. He has a fantastically angry look on his face, and a full head of dark black hair. For a guy who's basically a huge bowl of DNA soup, he sure does look like a non-ethnic white dude. An angry, angry white dude. Bonus points for giving him a passing resemblence to Hannibal, at least. In addition to the snake-mouth helmet, he's got a golden cape, a black dagger and the big cobra-hood shield that plugs into his back and rises over his head. No pet snake, this time. Firefly has forgotten more about explosives and detonating devices than most so-called experts have ever known. He is also a world-class long-range rifleman and an expert in the field of close-range combat with pistol and submachine gun. Firefly had a high enough degree of skill in martial arts to infiltrate the same ninja clan that produced Storm Shadow and Snake-Eyes. All of these are merely physical skills. What makes Firefly especially dangerous is his shrewd tactical mind combined with absolute ruthlessness. Recently captured Cobra documents indicate that Firefly is an active participant in their top-secret Venom program and has allowed Dr. Mindbender to test new batches of the Venom serum on him. If true, the Cobra saboteur is now twice as deadly as he was before. To me, as a kid, Firefly was known as "Gray Storm Shadow," because I thought they looked similar. I also thought TIE pilots were just Stormtroopers painted black, so as you might be able to tell, I didn't actually have most of those toys, and just had to play it by ear. This Firefly, which uses 90% of the same sculpt as the original, shows me just what a wrong-headed little twatter I was. Firefly is kitted out in camouflage pants and jacket, and is wearing a turtleneck beneath that. The figure's head is a new sculpt, which makes him look more sinister than the 1984 version. In addition to the grenades, dynamite, timers and pistol sculpted onto the figure, he's armed with a submachine gun, a cellphone and a backpack. Okay, so that second thing was probably supposed to be a walkie-talkie back in the day, but today a terrorist would be using cellphones to detonate his bombs, so we can pretend that's what it is. The backpack is pretty cool, since it's set up as a saboteur's toolkit: various bombs and explosives are sculpted on the upper part, and a panel on the back opens to reveal things like a socket wrench, screwdriver and pliers; Firefly can get to work in an instant with all this at his disposal. This set includes a reprint of GI Joe #49, Serpentor's first appearance. It's a good story, with a lot of action, weighed down only by the two-page scene in the middle which is obviously just an excuse to introduce everyone by name. Still, the introductory infodump - or "introdump," if you will - is nothing new to GI Joe as a property, so we can't really fault them for that. Nor can we fault them for not giving us a Serpentor who lives up to what we see in the comic. Yes, Scrap-Iron and Firefly are assigned to guard him, and yes, he has a removable green helmet, but the truth is that's just about the only thing he does wear. It takes a special kind of leader to command the troops wearing nothing but a snake-mouth helmet and a golden cape clutched about the nether regions, but that's the kind of guy Serpentor is. However, I think we can all agree that getting him with clothes on is a change for the better.